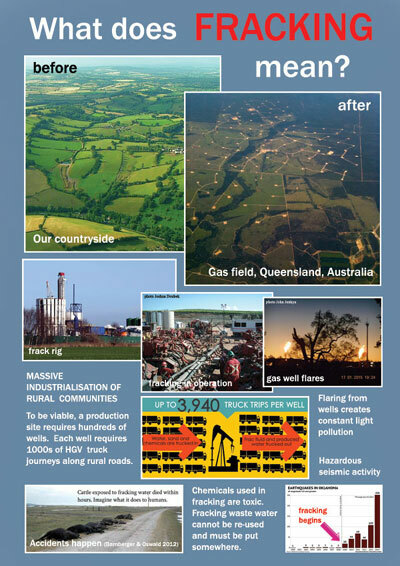 LEAFLETS: This 4pp A4 colour leaflet (on recycled paper stock) is intended for high street and door-to-door distribution and is aimed at those who may know little or nothing about fracking, and/or may not be inclined to research online. The project was crowdfunded successfully in late April 2015 and by the end of May 80,000 had already been sent on request all round the UK. A further 40,000 went out in the autumn, 40,000 in Spring 2016 and 40,000 in autumn/winter 2016/17. We've had some great feedback from volunteers and campaigners, including from Lancashire after the Council's landmark rejection of Cuadrilla's application (15,000+ leaflets went to campaigning groups there in the weeks preceding the decision). There is ample demand for these leaflets for distribution in many areas of the country, especially since the decision by North Yorkshire County Council in May last year to approve a fracking application in Kirby Misperton, and since the overturning of the Lancashire decision by central government last October. We regularly receive requests from a number of groups including newly started ones. Leaflets are made available in boxes of 1000 free of charge - simply contact us with your name and that of your group, address and tel for the courier. Funding further print runs: rather than setting up a new crowdfunder which takes a percentage and creates a time constraint, for the current print run we successfully invited "heartfunding" - a heartfelt contribution from concerned citizens to enable this project of directly informing the UK public to continue. This allows funds to be given ongoingly... For a print run of 40,000 plus shipping out to groups (we have a discounted UPS account) approximately £1.7K is needed. This works out at less than 4.5 pence per leaflet, very hard to match on a small print run, even more so on a home printer. A new print run will be ordered as soon as we reach £1.4K, leaving time to gather the last couple of hundred to cover deliveries. 2. by direct bank transfer - please use the contact form to request details.